Colorado has stressed the need for secondary scoring this season and it has gotten that in its first two games. Compher, the fourth-line center, has two goals and Wilson has added some punch on the second line. The Flyers ended their road trip with more than just a loss on the scoreboard. James van Riemsdyk, who returned to Philadelphia with a five-year contract over the summer, took a shot to the leg late in the first period and didn’t return. A game after he faced just 21 shots, Varlamov was tested by Philadelphia. He made 12 saves in the third period, including big stops when Colorado was clinging to a one-goal lead. He had five saves on the Flyers’ power play 3:20 into the last period to preserve the one-goal lead. Wilson iced it with his second goal of the game at 16:31, and MacKinnon scored into an empty net at 18:45. Sean Couturier and Mikhail Vorobyov had goals, and Brian Elliott stopped 30 shots for the Flyers. The teams traded goals early, with Wilson scoring 1:35 into the game and Couturier tying it six minutes later. 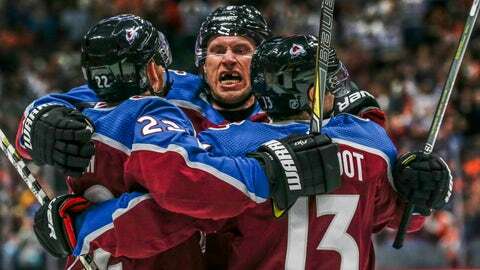 Colorado went back on top after a Philadelphia turnover led to Compher’s goal. The Avalanche returned the favor early in the second period when defenseman Mark Barberio went back to retrieve the puck but collided with Varlamov. Vorobyov put the loose puck into the empty net to tie it just two minutes into the second period. Landeskog broke the tie with a goal on a deflection at 7:18 of the second. He was tangled with defenseman Travis Sanheim in front of Elliott and got a stick just under the bar to redirect MacKinnon’s shot from the point. The Flyers challenged for goaltender interference, but the goal stood upon review. NOTES: Avalanche D Erik Johnson had three assists and LW Alexander Kerfoot had two. … The Flyers sent G Anthony Stolarz on loan to the Las Vegas Phantoms and activated G Calvin Pickard. Pickard cleared waivers earlier in the week. … Colorado D Patrik Nemeth (upper body) was a late scratch and Barberio took his spot in the lineup. Barberio was a healthy scratch in the season opener. … Couturier played in his 500th NHL game, all with Philadelphia. Philadelphia: Plays its home opener against San Jose on Tuesday night. Colorado: Travels to Columbus on Tuesday night.